Can you beat the beast? That’s a question many people will be asking in preparation for Barber Beast on the Bay, the region’s first fitness adventure challenge that the Barber National Institute will hold on September 7, 2013 at Presque Isle State Park. 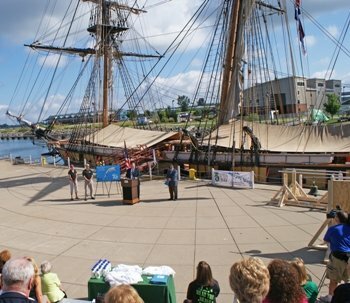 The new event, set to coincide with the 200th anniversary celebration of Perry’s battle in Lake Erie, will be a fundraiser to benefit services for the more than 3,600 children and adults served by the Barber National Institute. Barber Beast on the Bay will offer 12-mile and 6-mile course options that will include obstacles based upon the trials faced by sailors and ship builders in the War of 1812, as well as some of the challenges used in the training of Navy SEALS, America’s elite fighting corps. Design of the obstacles is being led by John Walker, a ten-year Navy SEAL veteran and owner of Executive Personal Fitness. In addition, Kathy Schreckengost, a physical therapist at the Barber National Institute, is chairing a committee to plan a corresponding event at Presque Isle for persons with disabilities. "The adventure challenges have become very popular around the country, but Barber Beast on the Bay will be unique for many reasons," said John Barber, president and chief executive officer of the Barber National Institute. "First, nowhere else in the world offers the physical features of Presque Isle State Park, with the lake and bay waters and miles of sand and trails. And our region’s celebration of the 200th anniversary of the War of 1812 will inspire many distinctive challenges and experiences that will set this event apart." Serving as a major sponsor is the Perry 200 Commission, which is providing a grant in support of the event. Sponsorships opportunities are also available at several levels for interested businesses. Assisting in the development of the course obstacles are architect Bob Marz, principal in Roth Marz Partnership, Martin McCormick, president of MGM General Construction Corporation and Structural Engineer Hank Graygo. Administrators from Presque Isle State Park, including Park Supervisor Harry Leslie, Jeremy Rekich and Bob North, are also assisting in planning. In designing the course, Walker wants to create a challenge for all participants—from the fitness warrior to the exercise enthusiast. "Everyone who does this is going to want a challenge," said Walker. “There is no pass or fail—the challenge is to complete as much of the course as you can. It will be a fun event that at the same time challenges you to push yourself to limits that you have never been able to achieve before." In keeping with the Barber National Institute mission, Barber said that the event will also include a corresponding activity for adults with disabilities that will be held beyond Beach 11 at Presque Isle. A team of educators and therapists from the Barber National Institute are now working to develop this course. Viewing areas will be set up to encourage spectators to cheer on participants, and food and entertainment will be provided at the Park. 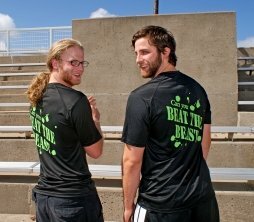 Early registration for the 6- and 12-mile course options will be $100 until June 30, 2013, when it will increase to $125. Sign up now to receive updates and look for additional information at the Facebook.com/BarberBeastontheBay.